Are you looking for a new or used Scaffolding truck? Here at MV Commercial we have stock of 7.5 tonne 18 and 26 tonne Scaffolding Lorries for sale or on contract hire. As one of the largest suppliers in the UK of purpose built scaffolding vehicles MV Commercial supply new and used Scaffolding trucks for all budgets. Our vehicles are purpose built with the scaffolder in mind providing simple and flexible loading of scaffolding beams and towers. If you have a specific requirement our in-house coach builders will build or modify any of our trucks to your exact specification within days. Making us one of the most flexible and reactive Scaffolding truck suppliers in the UK. As an independent commercial vehicle supplier we provide Scaffolding vehicles from several manufacturers including MAN, Scania, DAF and Iveco. Choose from the most fuel efficient or best payload scaffold trucks on the market. We build scaffolding bodies as flatbed or with dropsides but if you would prefer post holes and bolsters for greater flexibility we stock those too.For those that require additional payload we also supply vehicles from Mitsubishi, Hino and Isuzu. Our body sizes range from 20ft to 30ft depending on the application with most trucks having manual gearboxes, twin passenger seats and digital tachometers. Looking for a new or used scaffolding truck, but no ready to buy right now? Take a look at MV Truck Rental for all your scaffolding truck hire needs. We contract hire Scaffolding trucks of all weights from 7.5 tonne trucks to 26 tonne with several different Scaffold body types. We contract hire from 3 months to 36 months on fully maintained contracts providing you with piece of mind and the flexibility to grow your scaffold fleet without additional capital investment. Our fully maintained contract hire payments include all inspections, maintenance and servicing costs. The fixed payment also covers your annual road fund licence, fair wear on tyres and the use of a replacement vehicle to cover MOT’s and breakdowns. All you need to do is insure the vehicle and add fuel providing you with a fixed cost transport solution for your business. Need it in your company colours? No problem! We have our own paint facility with 60ft paint oven and a team of highly skilled painters working 24 hours, 7 days per week. No matter if you need a single scaffold truck painted or an entire fleet of trucks we offer a full end to end solution including livery delivered direct to your premises..
MV Commercial’s manufacture independence means that you can get our great value on any vehicle make. Looking for a unique design for your business? Our design and fabrication centre can custom build your vehicle for you. Want to part exchange your current fleet for a newer one? Speak to an account manager to discover our cost effective ways to grow your fleet. However you want to grow your fleet, we have the vehicle options to suit your needs and finance. We can build and supply scaffolding trucks with a wide range of features and specifications to make it a more effective vehicle. We offer several vehicles in our light weight scaffolding truck range. These vehicles can be plated to 7.5 or 10t to suit your needs. A lightweight and handy vehicle, our range of Iveco Eurocargos includes new, used and conversion vehicles that have been converted to scaffolding spec. Our range of DAF LF 180 Dropside Scaffolding Spec Vehicles have been purpose built for the scaffolding industry. These vehicles are ideal for a new or growing scaffolding fleet looking to expand into new areas. Our mid-sized range of scaffolding trucks include Scania, DAF and MAN models. Our Scania P Series scaffolding trucks most often feature sleeper cabs making them ideal for businesses that cover a wide market. In addition to the light weight DAF LF 10.180 trucks, we also feature several mid-sized DAF LF and CF trucks. A popular feature one these trucks are the optional bolsters. If you are a MAN fan, but looking for something a little bigger than the 10.180, take a look at the TGM 18.240 range of MAN trucks. 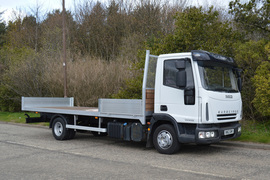 Our heavyweight range of vehicles also feature several scaffold spec crane trucks. These heavy-duty vehicles are the backbone of many established and up and coming scaffold businesses. As with all of our crane vehicles, we have a wide range of ready to go crane trucks that have been purpose built for the scaffolding industry. These vehicles can be fitted with a wide range of crane types including Cormach, Fassi, Palfinger and PM cranes.